Hindus all over worship more than 80 million gods and goddesses. 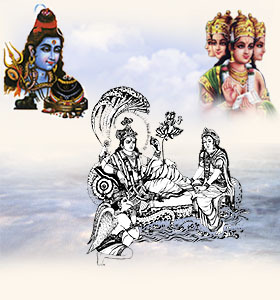 Brahma as the creator, Vishnu as the sustainer and Shiva as the destroyer. Ganesha is worshipped for good luck, Lakshmi for money and Durga for strength to conquer the evil within. Each god has many names, according to the place where he is worshipped and the function. Krishna is worshipped as Balaji in south and as Lord Jagannath in Orissa. This section will elaborate the significance of all the gods and goddesses and also detail the stories on mythology attached to them.